VENICE – Nine people were hurt, and at least one needed CPR, as an unusual summer beach lightning storm spread danger from Catalina Island to the shores of Santa Monica Bay on Sunday. Witnesses said the Coast Guard was helping search the popular beach, as at least one person believed to be in the water was still unaccounted for two hours after the thunderstorm moved through. And photos of a stricken diver being worked on by paramedics on the beach surfaced on social media. City fire paramedics set up a triage and treatment center on the crowded beach near Washington Boulevard, and one patient was rushed to the Ronald Reagan UCLA Medical Center. Two of the victims were critically hurt, city fire spokeswoman Katherine Mann said. The other eight had lesser injuries, with one hospitalized for panic. 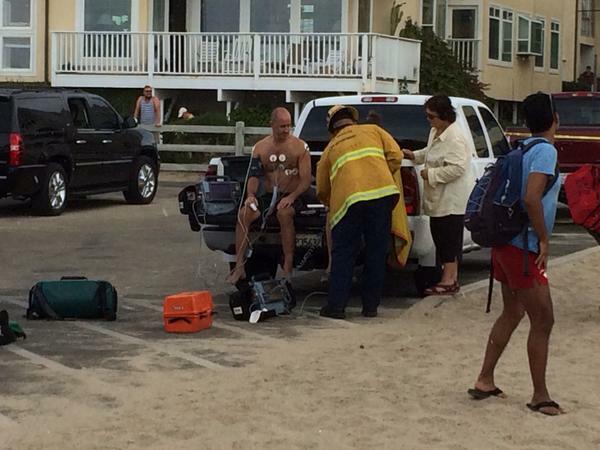 Eight adults and a 15-year-old youth were hurt on the beach, but reports of a swimmer hurt in the water and picked up by a Baywatch boat were struck down by the county fire department. County Baywatch crews were on scene, but it was not immediately clear if they treated anyone. A 57-year-old man suffered injuries described as minor when he was struck by lighting on the Catalina Island Golf Course, Los Angeles County Fire Department Capt. Dave Gillotte said. “He took an indirect hit,” the captain said. Lighting struck near the man at the Catalina Island Golf Course, travelled down a fence and shocked the man, knocking him off his feet. Los Angeles County and Avalon fire officials treated the man for minor injuries, “primarily injuries from the fall,” Gillotte said. The man was taken to a hospital for further evaluation. “We had a monsoonal type storm come through fast and furious, landing for about an hour and a half,” he said. The heaviest rain and lightning took place over a period of 35 to 45 minutes. The heavy storm also caused flooding and ignited at least four small brush fires on the island, Gillotte said. The fires never grew beyond a fraction of an acre before they were doused by firefighters and Catalina Conservancy Rangers, or self extinguished. Once the rain ceased, “We did a complete drive of all island roads, and two aerial reconnaissance flights, to ensure there was no fire or smoke,” Gillotte said. The storm took a narrow, fast-moving path over the island, Gillotte said. Catalina Island quickly began returning to normalcy once the storm passed. But first responders kept their eyes on the horizon, as additional storm cells were possibly moving over the island between 11 p.m. Sunday and 4 a.m. Monday. NORWALK >> Investigators are seeking a white Chevrolet Impala that fatally struck a 36-year-old Norwalk woman outside a house party before speeding away early Saturday, officials said. Belen Nieves died at a hospital within an hour of being struck about 12:50 a.m. in a residential neighborhoods in the 11900 block of Hopland Street, Orange County coroner’s officials said in a written statement. Deputies first began responding to the area after receiving calls of a loud party, Los Angeles County sheriff’s Sgt. Jose Navares said. While en route, officials received additional calls reporting bottles were being thrown and a possible assault. “When (deputies) arrived, they saw a female victim lying in the street,” Navares said. She was taken to the University of California, Irvine Medical Center where she succumbed to her injuries. Investigators determined the woman had been struck by a white Chevrolet Impala being driven by a Latino man in his 20s, Navares said. The car fled west on Hopland Street after striking the woman and had not been found Sunday. It was not clear Sunday whether Nieves had attended the party near the site where she was struck. Anyone with information was asked to contact the sheriff’s Norwalk Station at 562-863-8711. WHITTIER >> Police issued 16 citations and arrested two people with active warrants during a sobriety and driver’s license checkpoint in Whittier over the weekend, officials said. The checkpoint was held Friday night into Saturday morning at Lambert Road and Scott Avenue, Whittier Police Lt. Bryan Ellis said. Two drivers were given field sobriety tests, however no arrests for intoxicated driving were made, the lieutenant said. Slightly more than 950 vehicles were screened at the checkpoint, he said. Officers issued five tickets to unlicensed drivers, two tickets to people driving on suspended licenses and nine other citations for various violations, Ellis said. The two vehicles being operated by the drivers with suspended licenses were impounded, Ellis said. PASADENA — A 26-year-old Pasadena man was behind bars Sunday on suspicion of molesting a 14-year-old relative of his common-law wife, authorities said. Police arrested Pedro Munoz Zamudio Saturday afternoon on suspicion of child molestation and sexual assault, according to Pasadena police officials and Los Angeles County booking records. Officers responded to a report of a sexual assault early Saturday morning at a home in the 100 block of Painter Street, Pasadena police Lt. John Luna said. Investigators determined Zamudio had sexually assaulted a 14-year-old relative of his common-law wife, police said. The girl was taken to a hospital for examination. According to booking records, Zamudio was being held in lieu of $100,000 bail at the Pasadena Police Department’s jail pending his initial court appearance. ROWLAND HEIGHTS — A hazardous materials team responded to the U.S. Post Office in Rowland Heights Sunday after a suspicious white powder — ultimately determined to be baby powder — was found at the facility, authorities said. The incident began about 9:50 a.m., when someone called from the post office, 1521 Nogales Street, to report finding a “white, powdery substance” in an area where boxes are kept, Los Angeles County sheriff’s Sgt. Robert Causey said. There was no note or other suspicious material accompanying the powder. Firefighters who arrived to take a look at the situation summoned a sheriff’s hazardous materials team to continue the investigation, the sergeant said. Officials ultimately determined that the substance was ordinary baby powder and declared safe about noon. PASADENA >> A man suffered major head injuries but was expected to survive after he was struck by a car while pushing a bike across the street Saturday afternoon, officials said. A 30-year-old Pasadena man was pushing a bike east along Maple Street and crossing Los Robles Avenue about 2:20 p.m. when he was struck by a small sedan that was headed south on Los Robles Avenue, Pasadena police Lt. John Luna said. “The pedestrian struck the windshield of the vehicle and was thrown into the street,” the lieutenant said. He was taken to a hospital with major head injuries, but was expected to survive, Luna said. The 29-year-old Los Angeles man who was driving the sedan remained at the scene and cooperated with police, Luna said. The cause of the collision was being investigated by the Pasadena Police Department Traffic Section. NORWALK >> A 14-year-old boy suffered a gunshot wound to his leg in a drive-by shooting Friday afternoon, authorities said. The attack occurred about 3:15 p.m. at Sycamore Street, just west of Funston Avenue, Los Angeles County sheriff’s Lt. Eric Smitson said. The boy was standing with a group when a car passed by and someone inside opened fire, the lieutenant said. The teenage victim was struck in the leg. Officials described the car as a black, newer-model, four-door Nissan Altima. Witnesses indicated one of its windows may have been shot out. It was last seen westbound on Sycamore Street. The wounded boy was conscious and breathing when taken to a hospital with what was not believed to be a life-threatening injury, Smitson said. Deputies scoured the area for the Altima with the help of a sheriff’s helicopter and found a Nissan Altima believed to be the one involved in the shooting nearby, Smitson said. The registered owner was initially detained as a “person of interest” before deputies ultimately arrested him in connection with the shooting. Robert Angel Moncivais, 20, of Hawaiian Gardens was booked on suspicion of assault with a deadly weapon, according to sheriff’s Sgt. Jose Navares and Los Angeles County booking records. Moncivais was believed to have gang ties, and sheriff’s gang investigators were spearheading the investigation. According to booking records, Moncivais was being held in lieu of $50,000 bail pending his arraignment hearing, scheduled Tuesday in Bellflower Superior Court. AZUSA — Azusa police have teamed up with 7-Eleven this summer and begun issuing “tickets” to local children demonstrating good behavior, officials said. “The Azusa Police Department, in conjunction with the 7-Eleven Corporation, are proud to recognize those kids in our neighborhood who just ‘do the right thing,’” Bires said in a written statement. “We want to encourage our future leaders in continuing to make good choices, and help foster a great relationship between our little residents and the men and women who work hard to keep them safe. “Additionally, we want to encourage dialogue between kids and law enforcement officers in a non-threatening, non-enforcement type situation,” Bires said. Children will receive tickets for behaviors such as following the ruled of the house, following laws, being a good citizen, helping others, participating in the community and wearing helmets while biking or skateboarding. “If you are one of our awesome kids here in Azusa, and you’re doing the things mentioned above, just go up to one of our police officers and ask for a Slurpee ticket,” Bires said. Kids are asked to observe a few safety rules. Children are advised not to approach an officer who is busy on a call or speaking to someone, Bires said. Instead, police ask that kids wait until the officer finishes. Kids were also advised not to run into the roadway to reach a police car, ask an officer to stop a patrol car while driving or otherwise create traffic hazards. PASADENA >> An elderly Pasadena man turned up safe and sound after going missing from his retirement home Saturday, police said. The 87-year-old man was last seen about 10:30 a.m. before going missing from his home in the 500 block of E. Villa Street, Pasadena police officials said in a written statement. Officials asked the public’s help in finding the man. But he returned home Friday afternoon. Officials determined the man had gone for a walk in the heat and stopped in a nearby office building to cool down, Lt. John Luna said. A good Samaritan offered him some water before giving the man a ride back to his retirement home, the lieutenant said.